One Finnish artist has come up with an interesting and creative way to mock and bring attention to classist economic policies in Hungary. It's called Hunger King, and it's a fake restaurant on the streets of one of Budapest's most upscale districts. 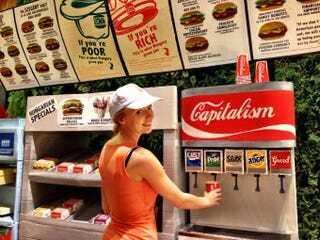 It's designed to look like a fake version of a fast food restaurant, but twists abound; as you can see above, the soda fountain is labeled "Capitalism" and instead of drink varieties, it apparently dispenses Deadly Sins (I am both terrified of and eager to see what happens when you tap the "Lust" fountain). But the real twist comes when you order: Hunger King does not serve food. Instead, it serves burger boxes filled with money equivalent to the daily minimum wage in Hungary — 3600 HUF or 12 EUR. There's a limit to the number of people it can "serve" a day, obviously — 50 on its first day and 20 every day since. It's set to stay open until July 6. Hunger King is the brainchild of Finnish artist Jani Leinonen, known for similar projects in Finland aimed at criticism of the inherent injustices in Capitalism, as well as the dangers of countries bowing down at the altar of multinational corporations (such as doing things like treating them as people). Problems related to economic inequality are especially prevalent in Hungary, where there are a tremendous number of people on the verge of starving, and Hungary's solution has basically been "ban the homeless from public spaces," because sure, the problem will just go away if you pretend it doesn't exist. There are more than one million people in Hungary below the poverty line. One day the poor Hungarians will have nothing left to eat but the rich.